I take a daily multiple vitamin every morning as part of my usual morning routine. Of course, some days it’s on the fly, particularly on those days the kids are dragging their feet getting ready for school, or conveniently ‘forgot’ something they needed for school today, causing an additional flurry of activity digging through piles of boxes to see if I could locate the box that particular item might be in. On those days I’ll dole out the kids’ gummy vitamins and then get my own vitamin out – I refer to it as a ‘horse pill’, due to its cumbersome size. I’ll critically size it up and hope that I either have enough coffee left in my mug to wash it down without it getting stuck in my narrow esophagus, or that my coffee isn’t too hot to take a swig to get that horse pill down without burning the you-know-what out of my esophagus. Or all of the above – burn my esophagus with too-hot coffee as the horse pill gets stuck on the way down. Livin’ on the edge here, people. I won’t lie and say that in those extra hectic mornings I haven’t scarfed a couple of the kids’ gummy vitamins to make sure I have most of my daily dose. After all, they’re meant for kids, and I may be a kid at heart, but that doesn’t count in the vitamin department. Let’s face it, if you had the choice of trying to swallow a pill that seems to be bigger than the circumference of your esophagus vs. chewing on a deliciously fruity gummy vitamin, you’d choose delicious over the other, right? I thought about taking one of each daily, but I wasn’t sure if that wouldn’t ultimately give me the best benefit, so I decided to alternate them every other day. I know, I make things sort of complicated, don’t I? I really prefer the taste of the Immune Support variety (that has ‘natural citrus and fruit flavors) does taste nice and fruity. The one for hair, skin and nails support (that has ‘natural berry flavor’) was a little less ‘fruity’ tasting, though certainly not unpleasant. 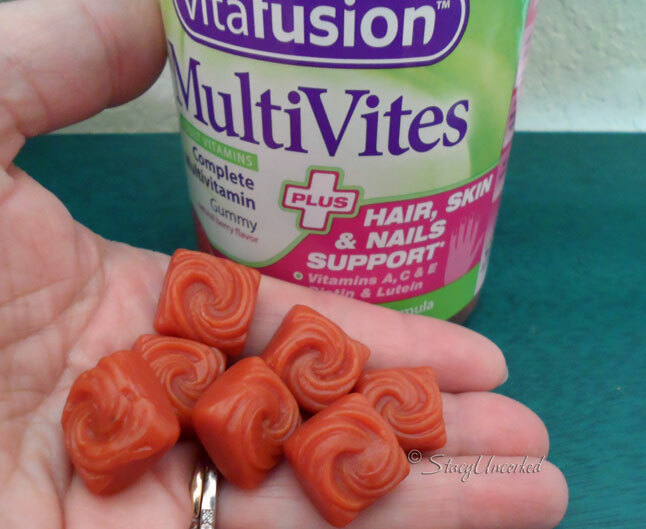 Vitafusion MultiVites PLUS makes nutrition taste good by combining the power of vitamins with a great tasting gummy. Healthy habits should be enjoyable so that you’ll keep on doing them. That’s why Vitafusion is helping people find their “healthy sweet spot,” where health and enjoyment collide through the small, daily activities and habits that help you healthier. All Vitafusion gummy vitamins are made in the USA with natural flavors. Now remember, the kids have their own made-just-for-kids version – these particular ones are specifically for us grown-ups and should not be served to children, no matter how tempting it might be. And if your kids are like mine, don’t emphasize that they’re like candy, because you don’t want them sneaking into your hiding place and helping themselves. I refer to their version as ‘Vitamin Bears’ so they (Little Dude in particular, since Princess Nagger is older and wiser) don’t get it stuck in their head that mommy has a delicious candy stash in the cupboard. Ahem. Now that I’ve had a taste of the sweet life, I won’t be going back to my daily horse pills again. 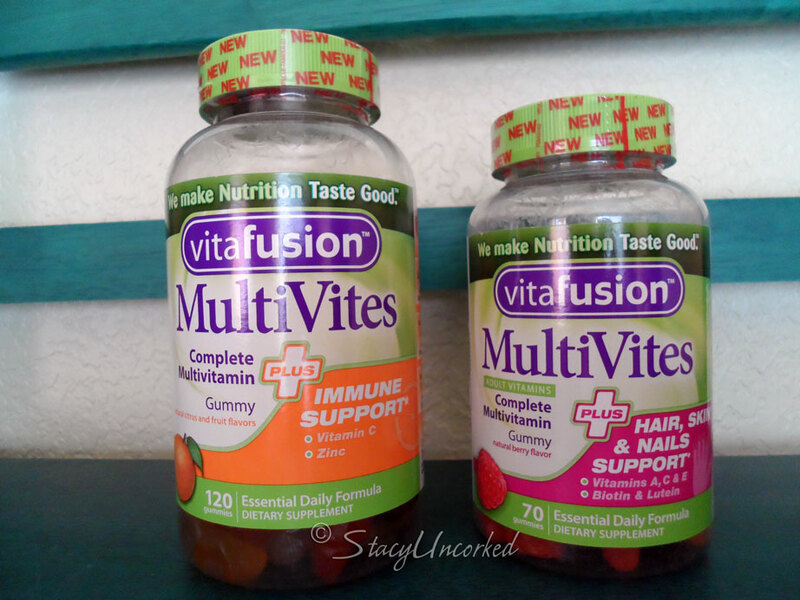 You can find out more information on Vitafusion’s entire collection of gummy vitamins here (make sure you have a program or app that can read PDF). Do you take a daily vitamin like a good boy or girl? Note: I participated in an Influencer Activation on behalf of Mom Central Consulting for Vitafusion. I received a product sample to facilitate my review and promotional item to thank me for participating. As usual, all opinions are my own and not influenced by outside sources. See my disclosure policy here. 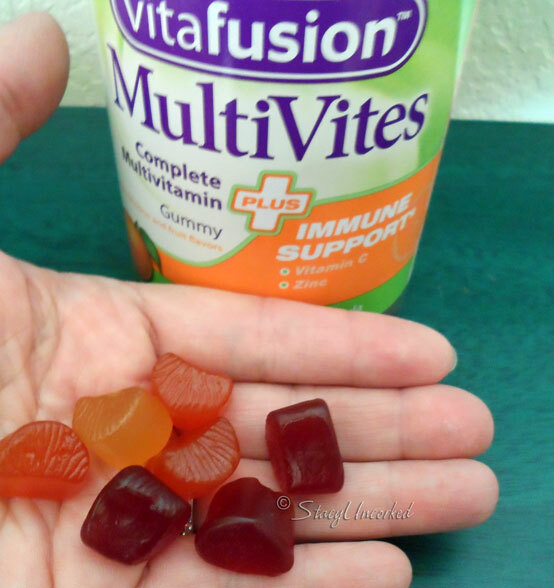 This entry was posted in Alert, Announcement, Review and tagged Alert, Announcement, daily vitamin, gummy vitamins, Review, Vitafusion, vitamins, yummy gummies for adults by StacyUncorked. Bookmark the permalink.